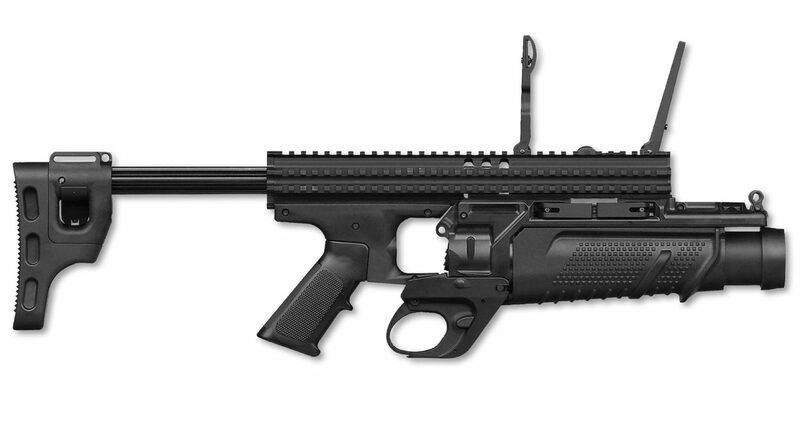 The FN40GL® Enhanced Grenade Launcher seamlessly integrates with the FN SCAR® 16 and FN SCAR® 17 rifles. Firing all types of 40x46mm NATO standard low-velocity grenades, the FN40GL® may be mounted under either rifle using a trigger adapter and dual locking clamp levers, or it may be configured as a stand-alone launcher. Completely ambidextrous, the FN40GL® utilizes a polymer receiver mated to an aluminum barrel for durability and light weight. The barrel swivels to the right or left for ease of loading and unloading from any firing position. The alloy stand-alone stock assembly quickly telescopes to fit all operators and is equipped with multiple MIL-STD-1913 mounting rails for lights, lasers and other targeting devices. The FN40GL® offers a traditional folding leaf sight or a mechanical quadrant sight system.